Thoughts on Parashat Noah . . . This week we chant the second portion (parashah) in the Torah, the well-known story of Noah, the Ark, the Flood, and the Covenant of the Rainbow. According to our story, Noah sent both a Raven and a Dove from the Ark after the flood waters receded, to determine if the waters had subsided sufficiently so that he and his family members and all the animals and birds could safely go forth from the ark onto dry land. 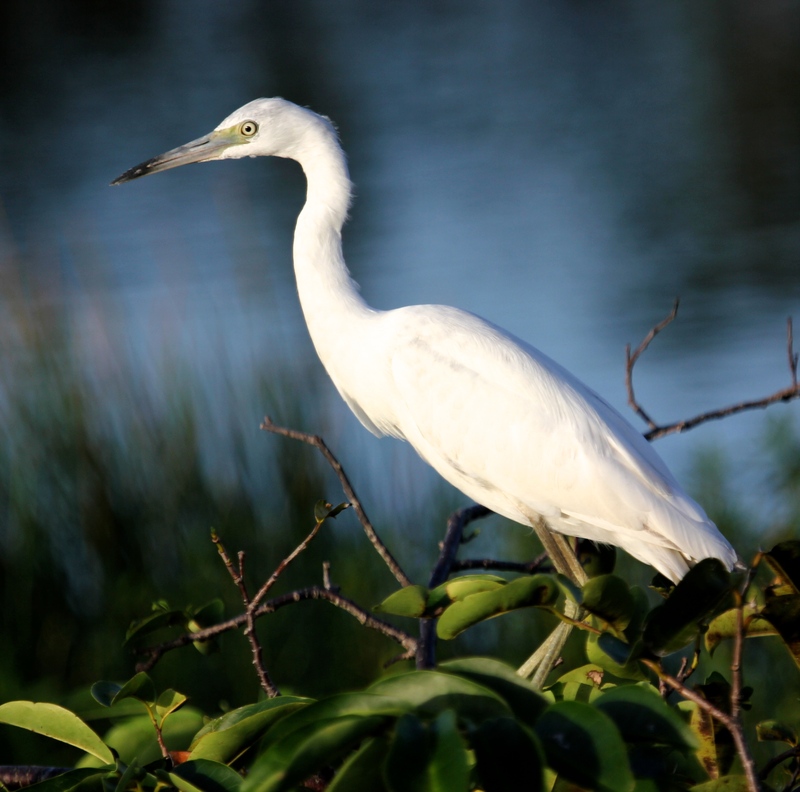 The roosting White Ibises featured on this post above, and this lovely juvenile Little Blue Heron below, make me think of the many beautiful Midrashim (interpretive stories) and legends about birds associated with the Torah. Our rabbi shared with us the following story recently, about the late Lubavitcher Rebbe: When he was asked how he had the stamina to work as hard as he did, the Rebbe replied: “Every person has a soul. It’s like a bird and its wings. Imagine if a bird were unaware that its wings enabled it to fly; they would only add an extra burden of weight. But once it flaps its wings, it lifts itself skyward. We all have wings – our soul – that can lift us as high as we need to go. All we have to do is learn to use them.” (Toward a Meaningful Life, S. Jacobson). Although birds are important figures in the Flood narrative, this week naturally makes me think of all the other creatures that may have accompanied Noah on his great adventure. 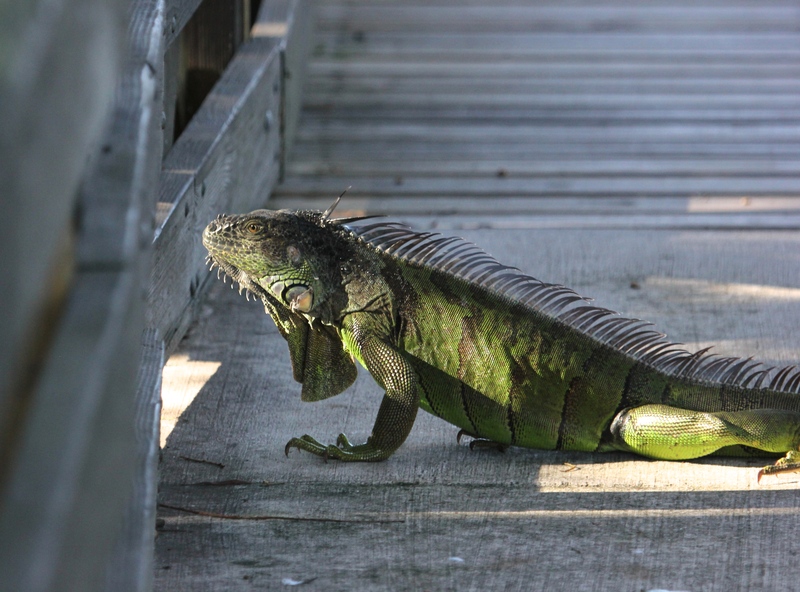 Right here in the wetlands, we see descendants every day of some of earth’s oldest reptiles – how wondrous! A few weeks ago, baby American Alligators were born in our wetland preserve to their very protective mother, who will watch over them carefully for about a year. It is a joy to observe them as they learn to venture a bit further each week from their mama. But, like human toddlers, they never stray too far from their “secure base”. In a sequence reminiscent of the Iguana above crossing over “to the other side”, this cute little fellow below laboriously clambered up onto his mother’s head, crawled across her shoulders, and immediately slid down back into the shallow water on the other side. This entry was posted in Birds, Judaism-Birds Connections, Marsh/Wetlands and tagged American Alligator, Little Blue Heron, Midrash, Torah, White Ibis. Bookmark the permalink. An interesting post. 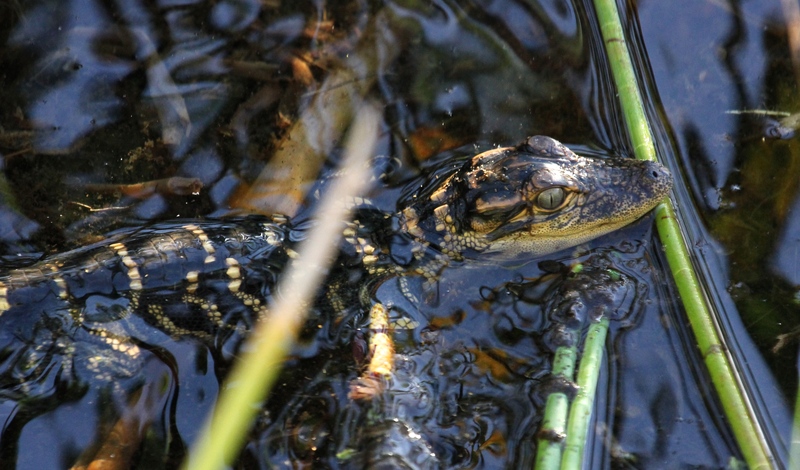 I’m a bit surprised that its only a few weeks since young alligators hatched – would have thought a bit earlier – but haven’t checked where you are geographically! I’m in the U.S., in South Florida, Sonja. Yes…good point! 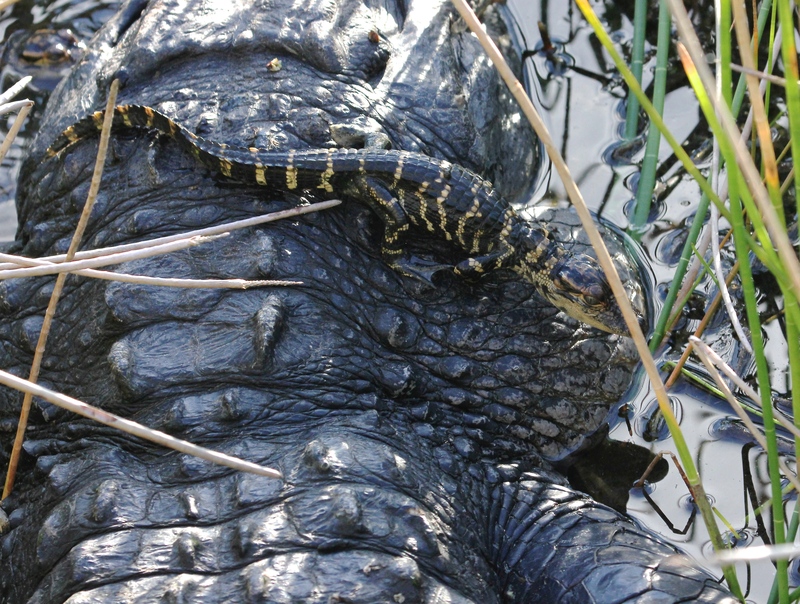 Generally, we expect to see baby gators hatching in about August – these were first seen in early September. Thanks for your visit! I so enjoy your way of blending photography with the Torah, and of pondering not only birds, but other animals with the Parashah! I love the Lubavitcher Rebbe’s quote. Thank you so much, Lorri. It is amazing how many connections there are! I really like Lubavitcher Rebbe’s story. The soul does have wings for those of us courageous to fly. To spread our goodwill and kindness , strengthens it for when it is all that is left of us to possess. Also, the references of birds in the Torah and Bible, I always thought dogs were God’s favorite creatures (although He loves all), but maybe He favors birds. They certainly are one of the most magnificent of creatures. I really like your iguana sequence. 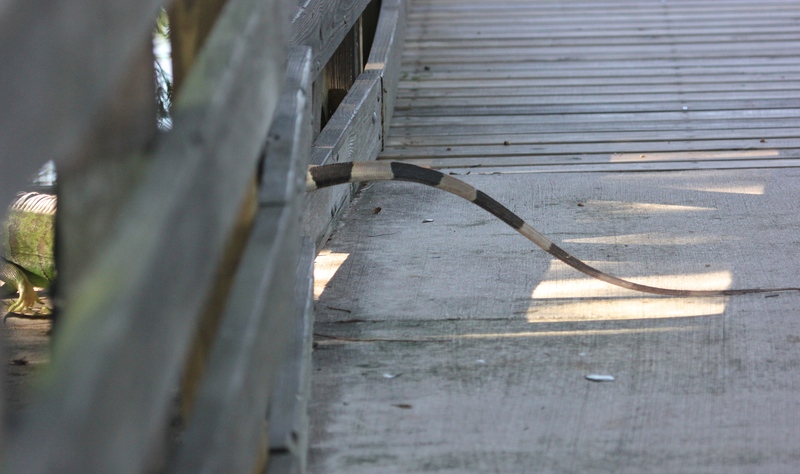 Just the tail between the guardrail slats…too cute. Thank you very much, Donna! Yes, the dog is known for his faithfulness and loyalty, as we see also in the name of Moshe’s loyal follower, Caleb (dog=kelev כלב in Hebrew). I see we have a lot of common interests!